You always knew your little girl was a goddess, but what would you do if you found out she was an actual, mythical being? We bet it would be quite a surprise, but once you see how divine she looks in this Greek Goddess Costume, it'll suddenly make perfect sense! Back in Ancient Greece, there was a whole host of gods and goddesses that were prayed to that represented pretty much every aspect of life. If you were a farmer, you could pray to Demeter, Goddess of agriculture, for hopes of a good harvest. Or, if you were about to go on a long expedition, you might want to pray to Artemis, Goddess of the wilderness, so that your party might have good luck while travelling through forests and hills. And then there is Athena, Goddess of wisdom and reason, who's good side you always wanted to be on, because whether you were fighting a war, or just building something, you'll probably want as much wisdom and reason as you can get! 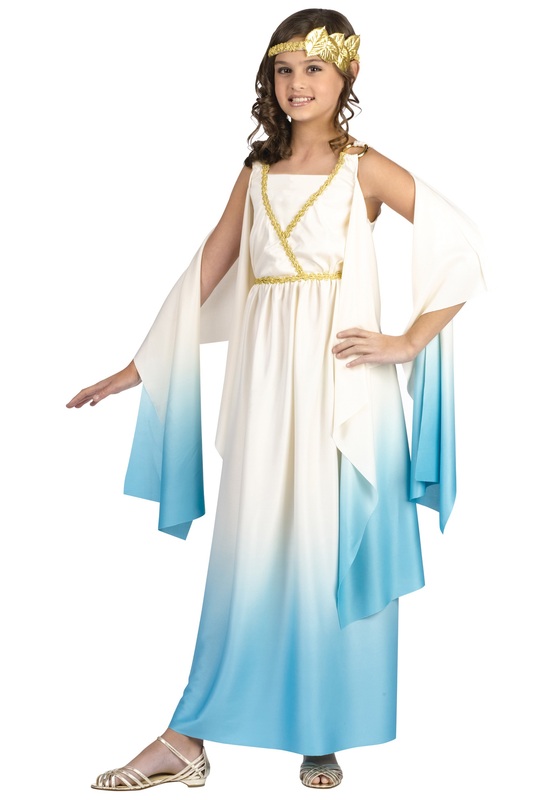 This classically inspired costume is designed to look like what a majestic goddess of Ancient Greece may have worn on Mount Olympus. The ankle length sleeveless dress and matching shoulder drapes fade from a cream color to turquoise, giving it an ethereal look. She'll look like quite a goddess once she puts on the included gold braided headband, and be sure to get her a pair of matching gold sandals to complete this mythical style!